Watt was born on March 22, 1989, in Waukesha, Wisconsin, to parents Connie, a building operations vice-president, and John Watt, a firefighter. Both of J.J.'s younger brothers are in the NFL as well – Derek Watt is a fullback for the Los Angeles Chargers, and T. J. Watt plays linebacker for the Pittsburgh Steelers. Watt played hockey from age four to age 13 and played for travel teams that traveled to Canada and Germany. He gave up hockey when weekly games started to conflict with his schedule and for financial reasons. Watt also played football throughout his childhood and became passionate about the sport while he was in fifth grade. Regarded as a two-star recruit by both Rivals.com and Scout.com, Watt was ranked neither among the top tight end nor among the top defensive end prospects in his class. After official visits to Central Michigan, Colorado, and Minnesota, Watt chose to play for Central Michigan under coach Butch Jones. Watt received a scholarship offer from Central Michigan University and matriculated there. He has stated that he was led to believe by Butch Jones that, as a tight end, he would have the opportunity to score touchdowns. At Central Michigan, he played 14 games, compiling 77 receiving yards and 8 receptions. Watt's coaches, led by Butch Jones, suggested that he move to offensive tackle, but Watt decided to forgo his starting spot and scholarship to walk on at the University of Wisconsin, where he played as a defensive end. At the University of Wisconsin-Madison, Watt was redshirted for the 2008 season and was named Wisconsin's Scout Team Player of the Year. In 2009, he played in 13 games as defensive end. In a game against Hawaii on December 5, 2009, Watt had a career-high of two sacks for nine yards, three tackles for loss, six tackles, and one quarterback hurry. Watt finished the season with 32 solo tackles, 12 assisted tackles, four and a half sacks, 15.5 tackles for loss, and five passes defended. He also earned his first letter. On November 20, 2010, against Michigan, he recorded his first collegiate interception. Overall, in the 2010 season, Watt played in 13 games and led the team in tackles for loss, quarterback hurries, blocked kicks, and forced fumbles. He finished the season with 42 solo tackles, 20 assisted tackles, 21 tackles for loss, seven sacks, one interception for 15 yards, nine passes defended, and three fumbles forced. He earned the Ronnie Lott Trophy in 2010, voted AP and Sports Illustrated second-team All- American, All-Big Ten first-team, academic All-Big Ten, and was voted the team's MVP. Watt skipped his senior season, entering the 2011 NFL Draft. At the 2011 NFL Combine, he was a top performer in all combine categories except the 40-yard dash. On April 28, 2011, he was first defenisive end selected in the first round by the Houston Texans with the 11th overall pick. The Texans signed Watt to a four-year, $11.24 million contract on July 31, 2011. In the 2011 season, Watt started all 16 games. In the season opener against the Indianapolis Colts, he had five tackles and a fumble recovery in his NFL debut. On November 27, against the Jacksonville Jaguars, Watt had his first multi-sack game with 2.0 in the 20–13 victory. Watt finished his rookie year with 48 solo tackles, eight assisted tackles, and 5.5 sacks. The Texans qualified for the playoffs for the first time in franchise history. In the playoffs, Watt recorded 11 solo tackles, three assisted tackles, an interception returned for a touchdown, one pass defended, and four sacks in two games against the Cincinnati Bengals and Baltimore Ravens. Watt was named Texans Team Rookie of the Year, USA Today All-Joe Team, and Pro-Football Weekly/PWFA All-Rookie Team. In 2012, Watt had one of the best seasons for a defensive player in NFL history. he finished the season with 69 solo tackles, 12 assisted tackles, 20.5 sacks, 16 passes defended, four forced fumbles, and two fumble recoveries. He was named the AFC Defensive Player of the Month in both September and December. On November 22, 2012, in a game against the Detroit Lions, Watt recorded three sacks, to give him a total of 14.5, breaking the Texans' record for sacks in a season, which was previously held by Mario Williams. On December 16, against the Indianapolis Colts, Watt recorded three sacks and ten total tackles in a 29–17 victory. 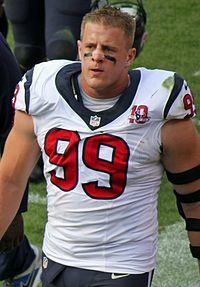 The Texans made the playoffs again in 2012, and Watt recorded six solo tackles, three assisted tackles, two passes defended, two sacks in two games. Watt finished the season 2.5 sacks shy of Michael Strahan's single-season record for sacks, set in 2001. Watt was named to the 2013 NFL Pro-Bowl Team on December 26, 2012. Watt also was named Texans Team Most Valuable Player, USA Football Fundamentals Team, PFW First-Team All-Pro, Pro Football Weekly/PFWA Most Valuable Player, NFL 101 AFC Defensive Player of the Year, AP First-Team All-Pro, and the AP Defensive Player of the Year. Watt received 49 out of 50 votes for the Defensive Player of the Year award. He is the first Texans player to receive an NFL Player of the Year award. Watt was the 17th defensive lineman and only the eighth defensive end to receive the award since 1971. Watt also made the highest debut on NFL Network's Top 100 Players list for 2012, coming in at number five. Watt had a strong season, but the Texans struggled as a whole, in the 2013 season. In Week 2, against the Tennessee Titans, he had his first two sacks of the season in a 30–24 win. From Weeks 7–12, he recorded at least one sack in each game. Overall, in the 2013 season, Watt recorded 65 solo tackles, 15 assisted tackles, seven passes defended, 10.5 sacks, four forced fumbles, and two fumble recoveries. The Texans, however, had a losing season and finished with a 2–14 record. 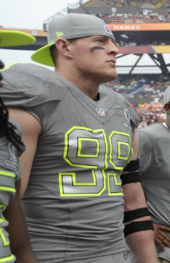 Watt was named to the 2014 NFL Pro Bowl and was a Pro Bowl Captain. Prior to the start of the 2014 season, the Texans and Watt agreed to a six-year contract extension, worth $100 million. He received $30.9 million at signing and he will receive $21 million at the start of the 2016 season if he is on the roster. This contract made him the NFL's highest paid non-quarterback, based on average yearly salary. In a game against the Oakland Raiders, on September 14, 2014, Watt became the first defensive player in Texans history to score a touchdown from scrimmage. Watt scored the touchdown on a one-yard catch after coming into the game as a tight end. He scored his second touchdown of the season on September 28, 2014, against the Buffalo Bills. Watt picked off a pass from Buffalo's EJ Manuel that was intended for Fred Jackson, and returned 80 yards for a touchdown. With this touchdown, Watt became tied at sixth for the longest interception return by a defensive lineman. Watt's touchdown was also the fourth longest interception return in Houston Texans history. During the game, Watt hit Manuel nine times, but was flagged twice for roughing the passer. Watt was fined $16,537 for only one of the incidents. Watt was named the AFC Defensive Player of the Month for September. In a game against the Indianapolis Colts, on October 9, 2014, Watt forced Colts quarterback Andrew Luck to fumble the ball. Watt recovered the ball and returned 45 yards for a touchdown. For his fourth touchdown of the season, Watt caught a two-yard pass from Texans quarterback, Ryan Mallett, for Mallett's first NFL touchdown pass. Watt recorded 4 solo tackles, an assisted tackle, a sack, a forced fumble, and a fumble recovery in the same game, which was on November 16, 2014, against the Cleveland Browns. Watt scored his fifth touchdown on November 30, 2014, catching a one-yard pass from Texans quarterback Ryan Fitzpatrick. With this reception, Watt became the first defensive lineman to have scored at least five touchdowns in a season since 1944. On December 21, 2014, Watt recorded his 54th sack as a Texan in a 25–13 win against the Baltimore Ravens. With that sack, he surpassed Mario Williams as the franchise leader in sacks. On December 28, 2014, he had a sack for his first career safety against the Jacksonville Jaguars which gave him three sacks on the day and 20.5 on the season, becoming the first player in NFL history to have 20 or more sacks in separate seasons. Watt also finished the season with a career-high 5 fumble recoveries and 5 touchdowns. For his outstanding season, Watt was unanimously named to the 2014 All-Pro First Team as a defensive end and named to the All-Pro second team as a defensive tackle. Watt was also named to the 2015 Pro Bowl where Cris Carter, team captain of Team Carter, selected Watt to be his captain on defense. During the game, Watt recorded a fumble recovery and an interception and after the game was named Defensive MVP. He also won the Defensive Player of the Year award, one of the few to win the award multiple times, and became the first defensive player since 2008 to get votes for the MVP award, receiving 13. After the season, Watt was named to the top spot in the NFL Top 100 Players of 2015. Despite battling a groin injury and a fractured left hand, Watt started all 16 games in 2015 making 76 tackles, an NFL-leading 17.5 sacks, 8 passes defended, 3 forced fumbles, and a fumble recovery. In the regular season finale, against the Jacksonville Jaguars, Watt had a season-high three sacks to go along with eight total tackles. He was named to the 2015 Pro Bowl, which was his fourth consecutive appearance, and also received his third Defensive Player of the Year award, the only player aside from Lawrence Taylor to do so. With the Texans finishing the season 9–7, the team clinched an AFC South division title but were shut out 30-0 by the Kansas City Chiefs in the Wild Card round. On January 12, 2016, Watt underwent groin surgery for a sports hernia. This forced Watt to withdraw from the 2016 Pro Bowl. This was his fourth straight Pro Bowl honors to go along with his fourth straight first-team All-Pro. He was ranked as the top defensive lineman and the third best player on the NFL Top 100 Players of 2016. On July 21, 2016, Watt underwent back surgery for a herniated disc. He began training camp on the PUP list, but returned in Week 1 to start the season in a victory over the Chicago Bears. In Week 2, he had 1.5 sacks and five total tackles against the Kansas City Chiefs. On September 22, in the game against the New England Patriots, Watt recorded two assisted tackles in last action of the season. On September 28, 2016, he was placed on injured reserve. The following day, he underwent back surgery again, and was officially ruled out for the rest of the season after playing three games and recording 1.5 sacks. Even though Watt played in only three games, he was ranked 35th on the NFL Top 100 Players of 2017. Watt returned from his injury to play in the season opener against the Jacksonville Jaguars. During Week 5 against the Kansas City Chiefs on Sunday Night Football, Watt left the game after an apparent leg injury. It was later revealed that he suffered a tibial plateau fracture in his left leg. He underwent surgery the next day and was ruled out the remainder of the season. In only 5 games, Watt finished with 11 tackles and 2 passes defended. Despite the limited action, he was still ranked 84th by his peers on the NFL Top 100 Players of 2018. During the 2017 season, Watt raised upwards of $40 million for relief and recovery efforts for the Houston area after Hurricane Harvey. The entire sum was raised through an online drive after he donated $100,000 of his own money as the starting base. Watt commented that this season "was always about more than football." Watt was co-named Sports Illustrated Sportsperson of the Year for 2017 for his humanitarian efforts. Watt was named Walter Payton NFL Man of the Year. Watt played ice hockey from age four until he was thirteen years old, traveling as far as Canada and Germany for tournaments. Watt said that he played "primarily as a center and was a goal scorer." Because of the financial cost of the sport and making a choice between hockey and football, Watt stopped playing hockey to focus on football. Watt has joked that he "may or may not" use skating as part of his offseason training. On February 15, 2018, Baylor College of Medicine announced that Watt would receive an honorary degree from their medical school. On May 29, 2018 He received the degree of Doctor of Humanities in Medicine. He is the older brother of Los Angeles Chargers fullback Derek Watt and Pittsburgh Steelers linebacker T. J. Watt. Since 2016, he has been in a relationship with Houston Dash soccer player Kealia Ohai and lives in Sealy, Texas. Watt was named the Grand Marshal of the 2019 Daytona 500. Watt is the president and founder of the Justin J. Watt Foundation, a charity organization that provides after-school opportunities for children in various communities, in order for them to get involved in athletics in a safe environment. This foundation's motto, "Dream Big, Work Hard" is sold on wristbands and T-shirts. Since this foundation was launched in 2010, Watt has raised over $1 million. While most of the schools that benefit from the fundraising are in Texas and Wisconsin, schools in Alabama, Illinois, and California have also received donations. Watt's mother, Connie, is the vice president of the organization. Watt and the J.J. Watt Foundation host a Charity Classic, Run/Walk, Golf Outing, and Tailgate annually. The Charity Classic is a softball game held at Constellation Field, in Sugar Land, Texas, in which Texans players participate in a game, and Home Run Derby to raise money for the foundation. The inaugural Charity Classic game was in 2013, and the 2014 Charity Classic raised over $436,433 towards his foundation. On August 26, 2014, Watt received the Texans Spirit of the Bull Community Award. On November 14, 2014, Watt was nominated for the NFL's Salute to Service Award that honors either a coach, player, or owner for their efforts in supporting the country's service men and women. Due to the extremely good turnout in 2014, the annual Charity Classic has been moved to Minute Maid Park, home of the Houston Astros. The 2015 event raised over $640,000. For the 2017 game, Watt invited Arnold Schwarzenegger and swimmer Simone Manuel, a two-time Olympic gold medalist and native of Houston. Watt is also known for his interactions with children. On July 2, 2011, the Berry family was traveling home from a vacation in Colorado Springs. The parents, Joshua and Robin Berry were killed in a head-on collision while also leaving their two sons, Peter and Aaron handicapped. Their daughter, Willa, suffered minor injuries. Watt met the children at a fundraiser and grew close with them. He played wheelchair basketball with them and mimed rolling a wheelchair after sacking a quarterback in a 2012 game. The mime was an agreed upon signal between the Berry children and Watt as a post-sack celebration. In 2012, following the Sandy Hook Elementary School shooting, Watt found out some of the families that were affected were in the Houston area. He invited them out on the field to hang out and throw the football. He then proceeded to give them signed merchandise that he had worn in previous games. In October 2015, he dressed up as Batman to surprise kids at the Texas Children's Hospital for a Halloween party. He also has raised over $37 million ($100,000 of which he personally donated) to help Houston recover from Hurricane Harvey, surpassing his initial goal of $200,000. After the Santa Fe High School shooting on May 18, 2018 that left eight students and two teachers dead, Watt offered to pay for the funerals of the dead. 2015 New Girl Himself "The Right Thing"
^ Rosenthal, Gregg. "J.J. Watt wins Defensive Player of the Year award". National Football League. Retrieved February 19, 2015. ^ Edholm, Eric. "J.J. Watt becomes only two-time 20-sack player, does so on safety". Yahoo! Sports. Retrieved July 22, 2015. ^ "J.J. Watt Stats, News, Video". ESPN. Retrieved November 29, 2014. ^ a b Ashley, Schumacher. "My Three Sons: Badger Mom Proud of Watt Brothers On, Off Field". UW Alumni. Retrieved November 29, 2014. ^ Pinchevsky, Tal. "NFL star J.J. Watt maintains love for hockey". NHL.com. Retrieved November 29, 2014. ^ "Texans' J.J. Watt has high school jersey retired at Pewaukee (Photos)". ^ a b "J.J. Watt Bio". Archived from the original on December 5, 2014. Retrieved November 29, 2014. ^ "J.j. Watt". Retrieved November 29, 2014. ^ King, Peter (September 4, 2013). "JJ Watt on how he can improve on one of the greatest defensive seasons ever - The MMQB with Peter King". The MMQB. Retrieved February 23, 2016. ^ "The life and times of J.J. Watt". Ultimate Texans. Retrieved February 23, 2016. ^ "WIAA State Championships Div II - Track & Field Meet". Athletic.net. Retrieved February 23, 2016. ^ "JJ Watt". Rivals.com. Retrieved November 29, 2014. ^ "J.J. Watt Stats". Sports Reference College Football. Archived from the original on December 4, 2014. Retrieved November 29, 2014. ^ "J.J. Watt 2007 Game Log". College Football at Sports-Reference.com. Retrieved February 18, 2018. ^ Warber, Kyle. "Fire Up Chips Exclusive: JJ Watt sets the record straight". MLive. Booth Newspapers. Retrieved November 29, 2014. ^ "J.J. Watt 2009 Game Log". College Football at Sports-Reference.com. Retrieved February 18, 2018. ^ "Wisconsin at Michigan Box Score, November 20, 2010". College Football at Sports-Reference.com. Retrieved February 18, 2018. ^ "J.J. Watt 2010 Game Log". College Football at Sports-Reference.com. Retrieved February 18, 2018. ^ McGinn, Bob (April 16, 2011). "State NFL draft prospects". JSOnline.com. Archived from the original on April 20, 2018. Retrieved April 20, 2018. ^ "NFL Events: Combine Player Profiles - J.J. Watt". National Football League. Retrieved October 9, 2012. ^ "*J.J. Watt - Wisconsin, DE : 2011 NFL Draft Scout Player Profile". www.draftscout.com. Retrieved September 24, 2018. ^ "NFL Events: Player Profile J.J. Watt". Retrieved November 29, 2014. ^ "2011 NFL Draft Listing". Pro-Football-Reference.com. Retrieved February 18, 2018. ^ Robinson, Charles. "Texans star J.J. Watt seeks 'same appreciation' that draft mates received with new contracts". Yahoo! Sports. Retrieved November 29, 2014. ^ "NFL Prospect J.J. Watt". Retrieved November 29, 2014. ^ "Indianapolis Colts at Houston Texans - September 11th, 2011". Pro-Football-Reference.com. Retrieved February 18, 2018. ^ "Houston Texans at Jacksonville Jaguars - November 27th, 2011". Pro-Football-Reference.com. Retrieved February 18, 2018. ^ "Houston Texans Team Encyclopedia". Pro-Football-Reference.com. Retrieved February 18, 2018. ^ "2011 Houston Texans Statistics & Players". Pro-Football-Reference.com. Retrieved February 18, 2018. ^ "Wild Card - Cincinnati Bengals at Houston Texans - January 7th, 2012". Pro-Football-Reference.com. Retrieved February 18, 2018. ^ "Divisional Round - Houston Texans at Baltimore Ravens - January 15th, 2012". Pro-Football-Reference.com. Retrieved February 18, 2018. ^ "Houston Texans: J.J. Watt". Retrieved November 29, 2014. ^ a b c d "Houston Texans J.J. Watt". Retrieved November 29, 2014. ^ "Houston Texans at Detroit Lions - November 22nd, 2012". Pro-Football-Reference.com. Retrieved February 18, 2018. ^ "Houston Texans Team History". Retrieved November 29, 2014. ^ "Indianapolis Colts at Houston Texans - December 16th, 2012". Pro-Football-Reference.com. Retrieved February 18, 2018. ^ "2012 Houston Texans Statistics & Players". Pro-Football-Reference.com. Retrieved February 18, 2018. ^ "Wild Card - Cincinnati Bengals at Houston Texans - January 5th, 2013". Pro-Football-Reference.com. Retrieved February 18, 2018. ^ "Divisional Round - Houston Texans at New England Patriots - January 13th, 2013". Pro-Football-Reference.com. Retrieved February 18, 2018. ^ "J.J. Watt Career Stats". Retrieved November 29, 2014. ^ Ganguli, Tania. "Watt sacked in quest for record". Chron.com. Retrieved November 29, 2014. ^ Wilner, Barry. "J.J. Watt Named 2012 AP NFL Defensive Player of the Year". Retrieved November 29, 2014. ^ "J.J. Watt named AP Defensive Player of Year". Retrieved November 29, 2014. ^ Ganguli, Tania. "J.J. Watt fifth, Arian Foster eighth on NFL Network's top 100". Retrieved November 29, 2014. ^ "2013 Houston Texans Statistics & Players". Pro-Football-Reference.com. Retrieved February 18, 2018. ^ "Tennessee Titans at Houston Texans - September 15th, 2013". Pro-Football-Reference.com. Retrieved February 18, 2018. ^ "Houston Texans at Kansas City Chiefs - October 20th, 2013". Pro-Football-Reference.com. Retrieved February 18, 2018. ^ "Indianapolis Colts at Houston Texans - November 3rd, 2013". Pro-Football-Reference.com. Retrieved February 18, 2018. ^ "Houston Texans at Arizona Cardinals - November 10th, 2013". Pro-Football-Reference.com. Retrieved February 18, 2018. ^ "Oakland Raiders at Houston Texans - November 17th, 2013". Pro-Football-Reference.com. Retrieved February 18, 2018. ^ "Jacksonville Jaguars at Houston Texans - November 24th, 2013". Pro-Football-Reference.com. Retrieved February 18, 2018. ^ "J.J. Watt 2013 Game Log". Pro-Football-Reference.com. Retrieved February 18, 2018. ^ "J.J. Watt Game-By-Game Stats". Retrieved November 29, 2014. ^ Rosenthal, Gregg. "J.J. Watt signs six-year, $100M extension with Texans". Retrieved November 29, 2014. ^ Corry, Joel. "J.J. Watt's New Contract Makes Him The League's Highest Paid Non-Quarterback". Retrieved November 29, 2014. ^ "Houston Texans at Oakland Raiders - September 14th, 2014". Pro-Football-Reference.com. Retrieved February 18, 2018. ^ Sidhu, Deepi. "J.J. Watt scores offensive TD at Oakland". Retrieved November 29, 2014. ^ "Buffalo Bills at Houston Texans - September 28th, 2014". Pro-Football-Reference.com. Retrieved February 18, 2018. ^ Sidhu, Deepi. "J.J. Watt scores on pick-six". Retrieved November 29, 2014. ^ Smith, Michael David. "J.J. Watt fined for roughing EJ Manuel". Retrieved November 29, 2014. ^ Patra, Kevin. "DeMarco Murray, J.J. Watt lead Players of the Month". Retrieved November 29, 2014. ^ Machir, Troy. "J.J. Watt forces and recovers fumble, scores third TD of season". Retrieved November 29, 2014. ^ "Indianapolis Colts at Houston Texans - October 9th, 2014". Pro-Football-Reference.com. Retrieved February 18, 2018. ^ "Houston Texans at Cleveland Browns - November 16th, 2014". Pro-Football-Reference.com. Retrieved February 18, 2018. ^ "Texans defensive star J.J. Watt scores fourth touchdown of the season". Retrieved November 29, 2014. ^ "Tennessee Titans at Houston Texans - November 30th, 2014". Pro-Football-Reference.com. Retrieved February 18, 2018. ^ Ganguli, Tania. "J.J. Watt scores 5th TD of season". Retrieved December 1, 2014. ^ "Baltimore Ravens at Houston Texans - December 21st, 2014". Pro-Football-Reference.com. Retrieved February 18, 2018. ^ "Houston Texans at Jacksonville Jaguars - December 7th, 2014". Pro-Football-Reference.com. Retrieved February 18, 2018. ^ "Houston wins division with defensive weapons". Sports Illustrated (Video). Retrieved June 25, 2016 – via Yahoo!. ^ "Video: J.J. Watt's Touchdowns in 2014". EndZoneScore. Retrieved February 23, 2016. ^ "J.J. Watt 2014 Game Log". Pro-Football-Reference.com. Retrieved February 18, 2018. ^ "MVP voters took note of J.J. Watt's historic season". ESPN.com. Retrieved February 23, 2016. ^ "'Top 100 Players of 2015': No. 1 J.J. Watt". NFL.com. Retrieved February 18, 2018. ^ "Jacksonville Jaguars at Houston Texans - January 3rd, 2016". Pro-Football-Reference.com. Retrieved February 18, 2018. ^ "2015 Houston Texans Statistics & Players". Pro-Football-Reference.com. Retrieved February 18, 2018. ^ "Wild Card - Kansas City Chiefs at Houston Texans - January 9th, 2016". Pro-Football-Reference.com. Retrieved February 18, 2018. ^ "J.J. Watt 2015 Game Log". Pro-Football-Reference.com. Retrieved February 18, 2018. ^ Ganguli, Tania. "Texans DE Watt undergoes groin surgery". espn.go.com. ESPN. Retrieved January 12, 2016. ^ "Chicago Bears at Houston Texans - September 11th, 2016". Pro-Football-Reference.com. Retrieved February 18, 2018. ^ Wesseling, Chris. "J.J. Watt undergoes surgery to repair herniated disc". NFL. Retrieved July 21, 2016. ^ "Kansas City Chiefs at Houston Texans - September 18th, 2016". Pro-Football-Reference.com. Retrieved February 18, 2018. ^ "Houston Texans at New England Patriots - September 22nd, 2016". Pro-Football-Reference.com. Retrieved February 18, 2018. ^ "Texans place J.J. Watt on Reserve/Injured". HoustonTexans.com. Retrieved September 28, 2016. ^ "J.J. Watt done for 2016 season after undergoing back surgery". NFL. Retrieved September 29, 2016. ^ "NFL Top 100 Players of 2017 - No. 35 J. J. Watt". ^ "Jacksonville Jaguars at Houston Texans - September 10th, 2017". Pro-Football-Reference.com. Retrieved February 18, 2018. ^ Wilson, Aaron. "Texans' J.J. Watt suffers tibial plateau fracture". Houston Chronicle. ^ Patra, Kevin (October 9, 2017). "J.J. Watt has season-ending surgery to repair fracture". NFL.com. ^ Bergman, Jeremy. "J.J. Watt out for the season with tibial plateau fracture". NFL. Retrieved October 9, 2017. ^ Boren, Cindy (October 9, 2017). "'I can't sugarcoat it, I am devastated': J.J. Watt apologizes to Houston after breaking leg". Washington Post. ISSN 0190-8286. Retrieved October 9, 2017. ^ "Complete list of tonight's 'NFL Honors' award winners". NFL.com. Retrieved February 4, 2018. ^ "J.J. Watt has historic 3-sack day". Houston Texans. Retrieved October 9, 2018. ^ Gantt, Darin. "J.J. Watt is the AFC defensive player of the month". NBC Sports. Retrieved January 6, 2013. ^ Sadley, Emily (October 22, 2015). "NFL star J.J. Watt's first love was hockey". Sportsnet.ca. Retrieved November 17, 2017. ^ Pinchevsky, Tal (September 5, 2013). "NFL star J.J. Watt maintains love for hockey". NHL. Retrieved November 17, 2017. ^ Corbett, Jim (October 9, 2012). "J.J. Watt goes from pizza delivery man to NFL star". USA TODAY. Retrieved February 23, 2016. ^ "Texans DE J.J. Watt has a new job: VP of Power Relations". Sporting News. Retrieved February 23, 2016. ^ Greco, Daniel (February 15, 2018). "J.J. Watt to Receive an Honorary Degree From Baylor College of Medicine". NFL.com. ^ Baylor College of Medicine (May 30, 2018). "J.J. Watt awarded honorary degree at 2018 Baylor College of Medicine commencement". Retrieved September 24, 2018 – via YouTube. ^ "J.J. Watt sends love to Kealia Ohai ahead of return from ACL injury". April 23, 2018. ^ Thompson, Dana (October 28, 2016). "Houston Dash player Kealia Ohai confirms she's dating J.J. Watt". Houston Chronicle. Retrieved March 10, 2019. ^ "J.J. Watt named grand marshal of Daytona 500". Chron. Retrieved February 12, 2019. ^ "Julian Edelman, J.J. Watt honored at Daytona 500". NFL. Retrieved February 17, 2019. ^ Malisow, Craig (September 14, 2017). "J.J. Watt Raised $33 Million for Harvey Relief – But Where Will It Go?". Houston Press. Retrieved July 13, 2018. ^ a b Galehouse, Maggie. "J.J. Watt Foundation helps kids Dream Big, Work Hard". Houston Chronicle. Houston Chronicle. Retrieved December 5, 2015. ^ "Highlights: J.J. Watt Charity Classic". Houston Texans. Houston Texans. Retrieved December 5, 2015. ^ "JJWatt Foundation". Retrieved November 29, 2014. ^ Endress, Alex. "J.J. Watt Charity Classic raises $436,433 towards afterschool athletics; features tomfoolery". Retrieved November 29, 2014. ^ "J.J. Watt wins team award". Retrieved November 29, 2014. ^ McClain, John. "J.J. Watt nominated for NFL's Salute to Service Award". Retrieved November 29, 2014. ^ "Breakfast: Star power at Watt's Charity Classic". Retrieved May 10, 2017. ^ Davenport, Gary. "Why J.J. Watt Should Be Your Favorite NFL Player". Bleacher Report. Retrieved May 10, 2017. ^ Litman, Laken. "5 Coolest J.J. Watt moments". For The Win. For The Win. Retrieved December 5, 2015. ^ "Houston Texans' J.J. Watt dresses up like Batman for hospital visit - Houston Texans Blog - ESPN". ESPN.com. Retrieved October 16, 2015. ^ "Houston Flood Relief Fund - YouCaring.com - Web". YouCaring.com. Retrieved September 6, 2017. ^ "J.J. WATT DONATES $100,000 TO HURRICANE HARVEY VICTIMS". dailycaller. Retrieved September 18, 2018. ^ "Report: J.J. Watt to pay funeral costs of Santa Fe shooting victims". sportsnet.ca. Retrieved May 19, 2018.